Today, Russia, Turkey, and Iran urged all countries to take an active part in restoring Syria not in words but in deeds. This concerns economic and political measures. The signed declaration emphasizes Syria's territorial integrity and the strengthening of its sovereignty. It is a must-read, considering who its authors are. Questions at the press conference were not limited to the topic of Syria; Skripal was discussed again. Pavel Zarubin reports on this. 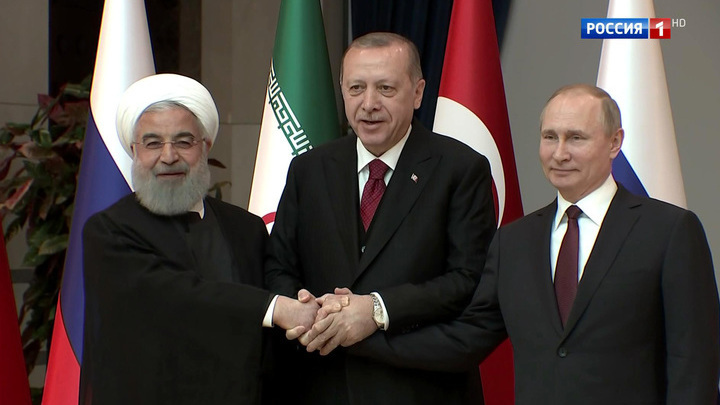 The presidents of Russia, Iran, and Turkey are together again at the second summit on Syria. Each shot is important. While the leaders are being photographed, their assistants are busy with the last minute arrangement. Here, the head of the Turkish Foreign Ministry is pointing his finger at the text. Looking at how carefully he reads and verifies every word this is either the speech of President Erdogan or the leaders' statement. The three presidents held negotiations behind closed doors, but this time they finished quickly enough. The leaders of Russia, Iran, and Turkey confirmed Syria's territorial integrity in a joint statement which is fundamentally important. President Putin: "Such position is especially significant today amidst the increasing attempts to aggravate inter-ethnic and inter-confessional contradictions in the Syrian society in order to shatter the country to pieces and preserve the Middle East conflict potential for many years to come. As an overall strategic goal, we aim at completely destroying terrorists who continue attempting to destabilize the situation on the ground and preparing to destroy the peace process efforts. By any means necessary. We received irrefutable evidence proving that militants prepared provocations using toxins". Erdogan, the host of the summit, decided to turn closing remarks into a big press conference. The journalists asked Putin about Skripal: "What is Russia expecting after the latest news?" Even the British special laboratory can't establish the toxin's country of origin. President Putin: "We do not expect anything. We expect that common sense will prevail in the end and international relations won't be damaged, which we have seen lately. This concerns not only the Skripal case but also other aspects of international relations: We need to get into the framework of healthy political processes which are based on the fundamental norms of international law. And then the situation in the world will become more stable and predictable". Hasan Rouhani, Iranian president: "Look, Americans say one thing today, and another tomorrow. First, they said that they would leave Syria, and then, that they would like more money after all and then, they demand other parties to give them money so that they can stay longer. We understand that they want to "milk" some countries to continue staying in this country". Recep Tayyip Erdogan, Turkish President: "My friend Rouhani talks about 7 trillion dollars. Can you imagine? It is still in this region, we need to return this money. If this money is collected, this will facilitate the process, undoubtedly". Fresh strawberries, grapes, and sweets: eastern hospitality for the members of the important summit. Turkey also treated the delegation leaders and members with nuts. Here, everything was done at the highest level. Dozens of boxes with flags were delivered to the presidential palace in advance and signed in Turkish — "Russia", "Iran". All of them were taken to the final press conference with the leaders. And the young man was literally forced to return when he nearly carried the last Turkish flag away. He had to turn back. Before the tripartite summit, the presidents spoke in person — first, Erdogan and Rouhani, then — Putin and Rouhani. The Iranian delegation even brought a portable air-humidifier for its leader's constant comfort. Though they didn't manage to assemble it right away. The meeting between Putin and Rouhani caused some incredible excitement among the Iranian journalists; they clearly interfered by starting their broadcasts right at the time of the presidents' speech. At the final press conference, the leaders declared of a joint determination to speed up their efforts to ensure calm on the ground, as the statement said. The only way to solve problems is political settlement and gradual economic recovery. President Putin: "We urge all the countries of the world to take part more actively, not in words, but in deeds. Everyone is talking about the need to get involved in humanitarian aid, to begin with, but no one does anything except Iran, Turkey, and Russia. We see small supplies through the UN, but this is not enough. We hope that after political processes are completed the work on restoring Syria and its economy will acquire a broad, large-scale nature". It's clear that another such summit will be needed — today it was announced that it would be held in Iran. Pavel Zarubin, Andrey Melnikov, Dmitry Ermolenko, Aleksey Karpuhin, Andrey Sorokin, Vladimir Ozerov, Vesti, Turkey.